Due to its amazing popularity in 2012 Blue Chip Feed Limited are continuing their sponsorship of the Flat Ridden Sports Horse class in 2013. 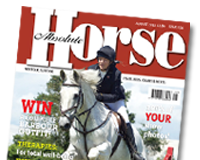 There are over 30 qualifying classes which are held at shows across the country for the final at The SHB (GB) National Hunter Show at Bury Farm in Buckinghamshire on 2nd September 2013. This year will see the addition of horses that are 6 years old and over qualifying to compete in the final.